First announced many years into the production run of the smaller H.130C model the 140 mm centre height by 750 mm (29.5") between-centres H. 140E maintained the De Valliére tradition for quality and was just as heavily constructed (730 kg) and as well made as its smaller brother. Although having only a very modest 10 mm (0.25") increase in centre height, the 140 was an almost completely new design (of some complexity of operation). It gained both a massive 50% increase in weight and a variety of technical improvements, designed to improve its performance and accuracy under arduous use, as well as a very much more sophisticated screwcutting gearbox At over 240 mm (8.5") the width of the induction-hardened and ground grey cast-iron bed was near to twice the centre height - a good basic test of whether a machine is intended for toolroom or heavy-duty work - and of enormous depth and strength. Although no gap was fitted to the bed, at the headstock end a 200 mm (8") length of the casting between the ways was carefully radiused out to allow the fitting of a 300 mm (12") faceplate. 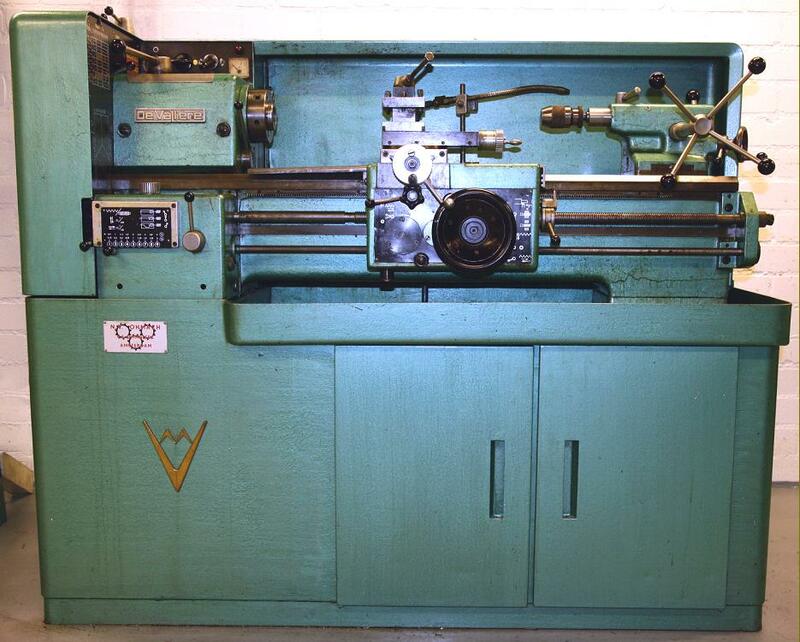 Two V and two flat ways were used and the makers guaranteed parallelism between then of better than 0.005 mm (0.0002/3"). Like the earlier H.130C, the 140 had headstock driven by a "Silent" chain-and holding a 35 mm (1.375-inch) bore, heat-treated and ground nickel-chrome No. 4 Morse taper spindle that ran on three English-made Gamet "micron-precision" machine-tool class taper roller bearings. 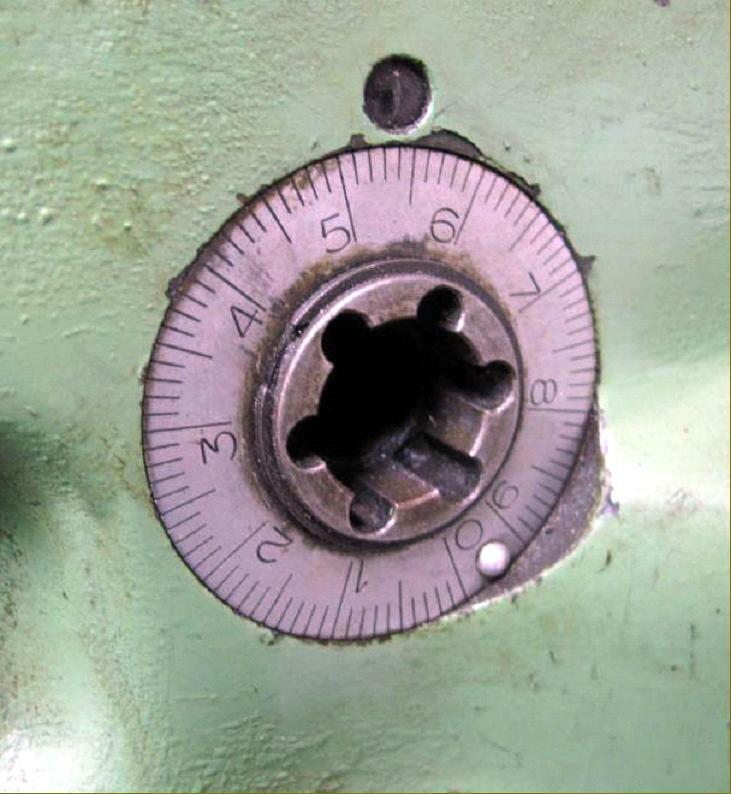 The two immediately behind the D1-4" Cam-lock spindle nose were of the opposed and pre-loaded type and both sets were "spring loaded" to allow for expansion as the machine warmed up - and so obviated the need for adjustment during their very long service life. The rear of the spindle was engineered to accept various types of collet closer: pneumatically powered, quick-action lever or a handwheel-operated collet draw-in tube. With a generous 16 speeds spanning 26 to 2500 r.p.m. the headstock's 8 : 1 ratio "backgears" were engaged by a single lever on the inside face of the headstock. 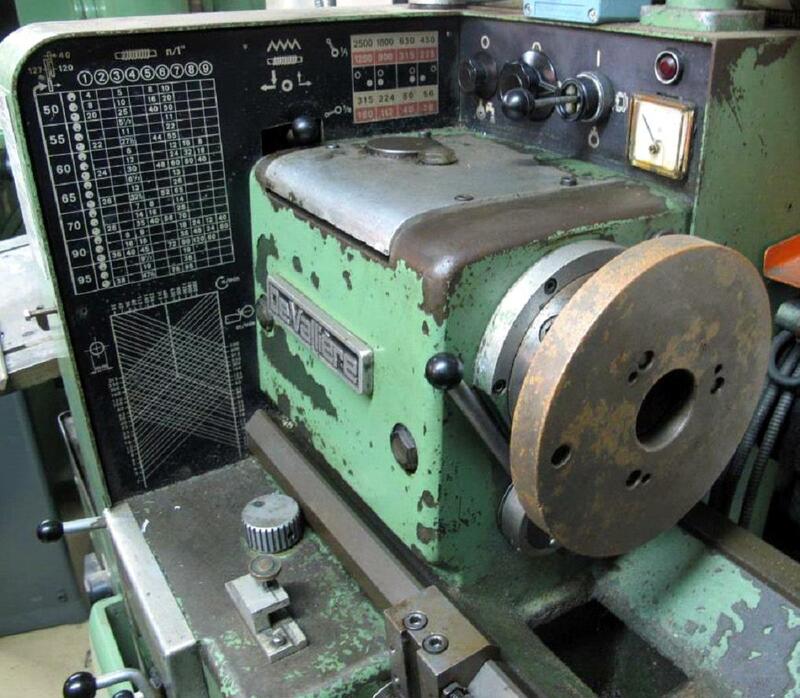 The gears were unusually wide and cut to a fine pitch to reduce chatter; both they and their ball-bearing supported shafts being manufactured in nickel-chrome steel, heat treated to give a hardness of 400 Brinnel and ground all over on Reishauer, Maag and Matrix machines. Pumped oil was delivered from a remotely-mounted tank to the headstock, base-mounted speed-change gearbox and the screwcutting gearbox however, instead of the system found on many machines where lubricant that had passed through a gearbox was also circulated straight into the spindle bearings, in the case of the 140E each bearing was provided with its own filter (accessible from outside) that ensured dirt and metal shavings were excluded. 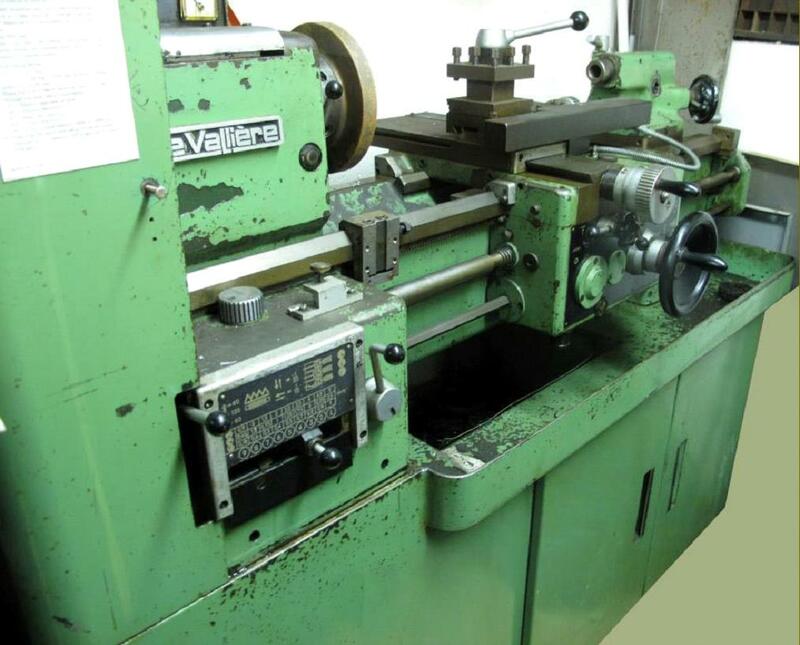 De Valliére were very particular about the oiling requirements and in the lathe's handbook carefully detailed how to manage the cleaning and other requirements when the change was made from one oil to another after the machine's initial 100-hour running in period had ended. An extra-cost option, the patented screwcutting gearbox was totally enclosed and pressure lubricated from sump supply that was also sent to the headstock and spindle-speeds gearbox; to the delight of the lucky operator, the box was designed to be operated by one hand whilst the lathe was in motion; a clutch allowed the leadscrew drive to pass straight through the box and so be used for generating "special leads" - presumably very coarse pitches (by arranging changewheels) that would otherwise not have been available. The drive to the quick-change screwcutting gearbox was by demountable changewheels with engagement and reverse of the feed by a lever mounted in the top left-hand corner of the headstock's front face. A mechanism built into the box and operated by a single lever (positioned vertically at the right hand side of the front face of the box) was used to isolate the drive, allow it to transmit via the gears within the box or transmit straight through the box to allow the generation of very coarse pitches. A long rod, running the length of the bed, carried two adjustable stops that engaged a mechanism whereby the leadscrew drive was instantly stopped - a wonderfully useful device that allowed threads to be safely run into a blind hole, or against a face. As further complication the device could also be employed in a manner that approximated to semi-automatic thread cutting where (so long as the pitch of the thread was divisible exactly by the pitch of the leadscrew) after the carriage hit the left-hand stop all the operator had to do was engage the feed again and the carriage would run back at high speed to contact the right hand stop - and thus be instantly ready to begin the next cut. 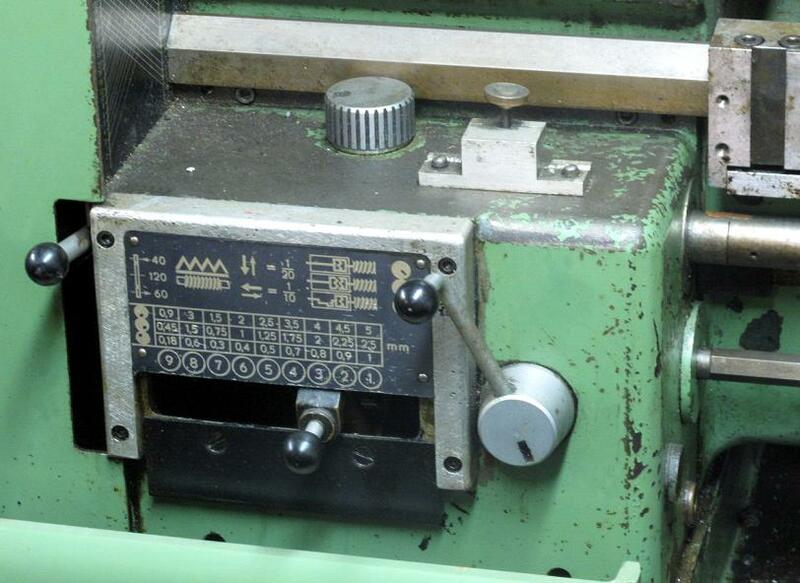 Combined with the Hardinge-like quick-withdrawal lever fitted to the cross-feed screw (it withdrew the cutting tool up to 6 mm/1/4") a practiced operator could screwcut at high speed in complete safety. As with the 130 - and with an eye to their important export markets in the USA and Great Britain - De Valliére offered both metric and English gearboxes with (shear-pin protected) precision ground and hardened leadscrews of 4 t.p.i. and 6 mm pitch respectively. 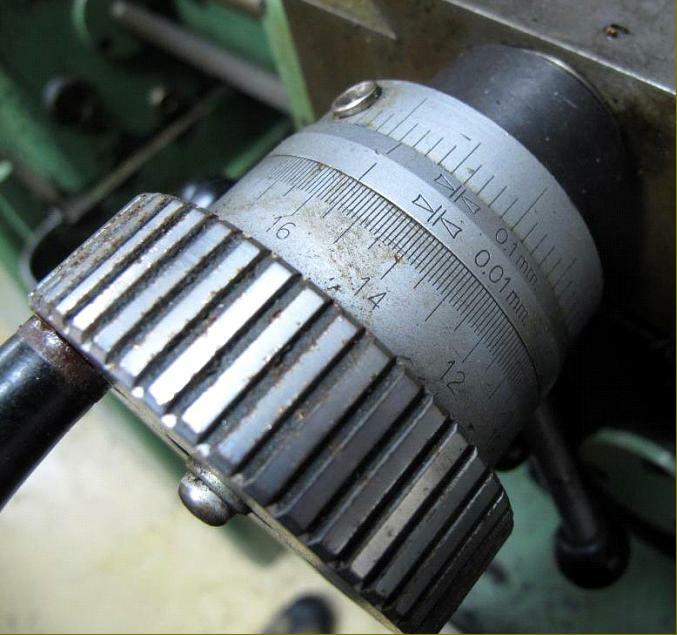 The metric box gave 27 different pitches from 0.18 to 5 mm pitch and, with conversion gears, a further range of English threads from 4 to 120 t.p.i. 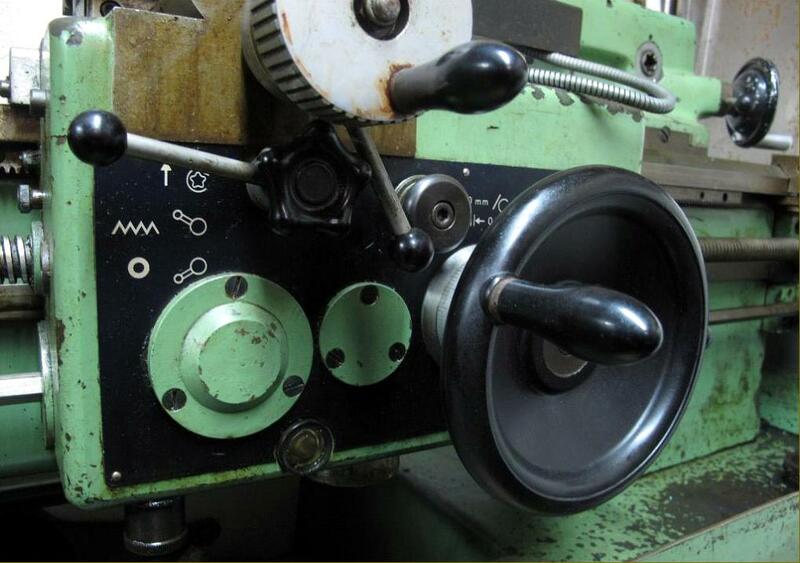 The rates of sliding feed varied from 0.018 to 0.5 mm and surfacing feeds from 0.009 to 0.25 mm. (per revolution of the spindle). The English box gave 60 different pitches from 3 to 184 t.p.i. and, with metric translation gears, a selection of metric threads from 0.10 to 6 mm pitch. The rates of sliding feed varied from 0.0005" to 0.016" and surfacing feeds from 0.00025" to 0.008" (per revolution of the spindle). As an indication of how seriously the company took their concerns with design details intended to promote accuracy and longevity, to relieve the leadscrew of stress its driving gear was supported on a set of independent bearings and its 90 mm (3.75") long bronze clasp-nut ran in hardened and ground guides. 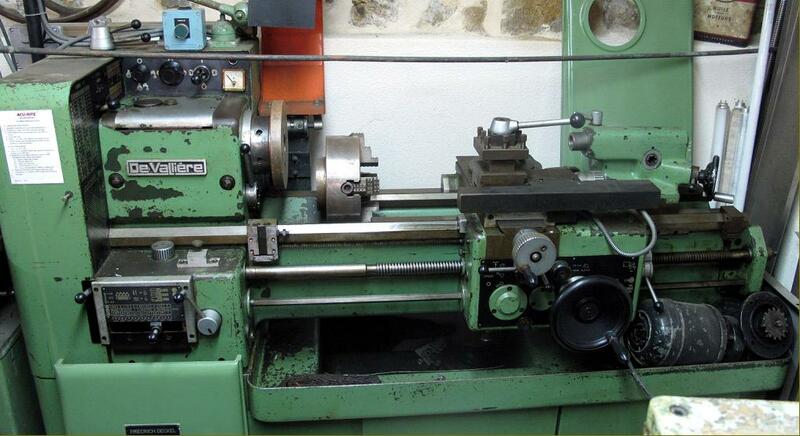 A separate power shaft, protected by a shear pin and running at 1/10 the speed of the leadscrew, drove the sliding and surfacing feeds; it was fitted with an automatic knock-off control that, being designed to respond without backlash, allowed very precise setting of the disengagement point. 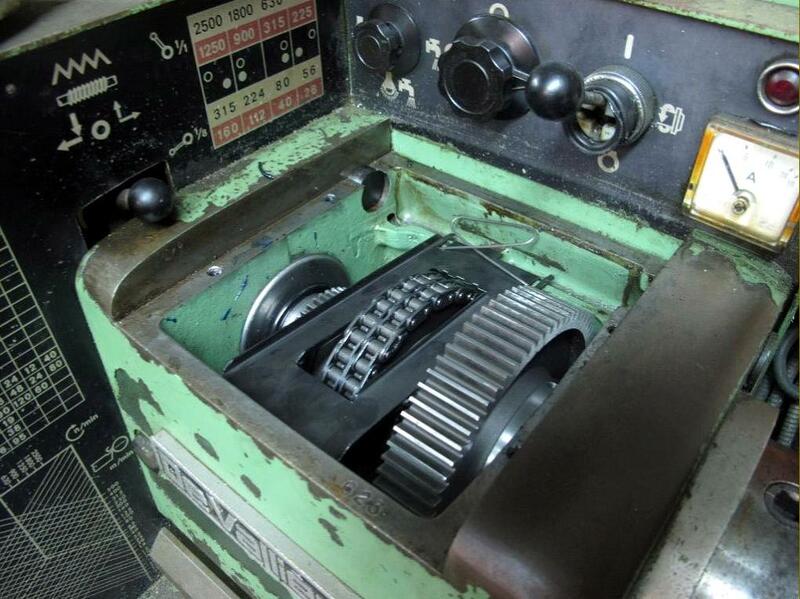 The screwcutting and feeds gearbox was modified at some point with a slight improvement in the feed selection mechanism - two dials replacing the single one at the top and levers in place of the sliding tumbler. 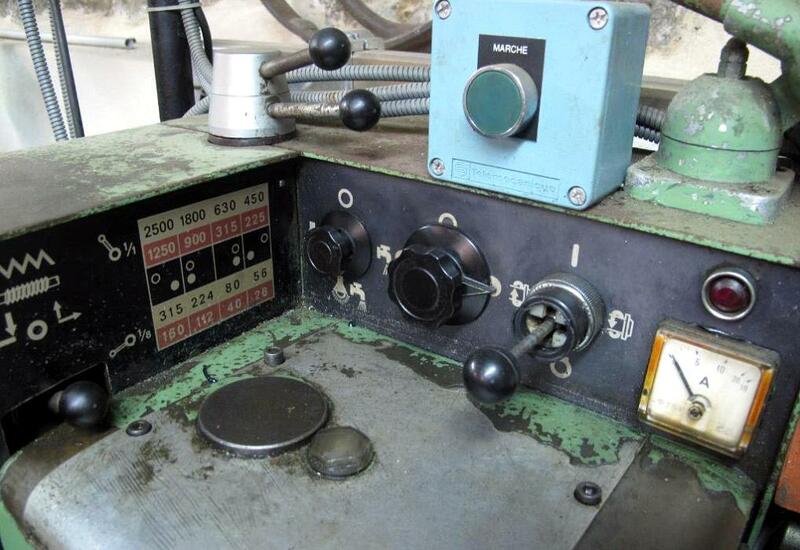 Both early and late boxes allowed the operator to select any feed or pitch listed without having to change or dismount any changewheel. 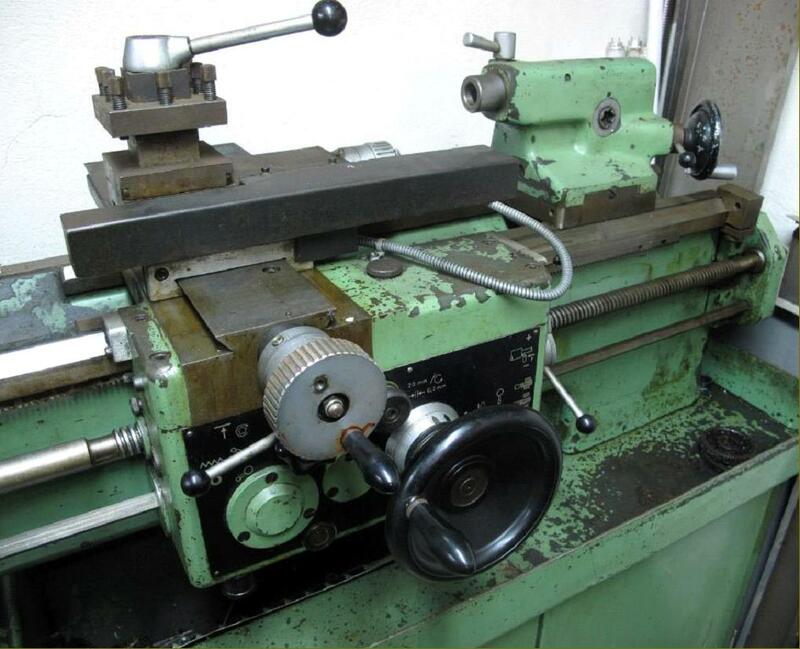 The same evolution also applied to the French Ernault AC140 - a lathe that became the AC280 when exactly the same sort of modification was carried out to its screwcutting gearbox. Doubled walled and completely enclosed, the apron held an oil supply that was pumped around the assembly by the action of a lever mounted on the right hand face; besides activating the oil pump, the lever both engaged the leadscrew clasp nuts (by being moved to the left) and the power sliding and surfacing feeds (by being moved to the right and then or down). The drive inside the apron was protected by shear pins through both feed and leadscrews and also by an internal patented magnetic load limiter the setting of which could be adjusted by an outside control. 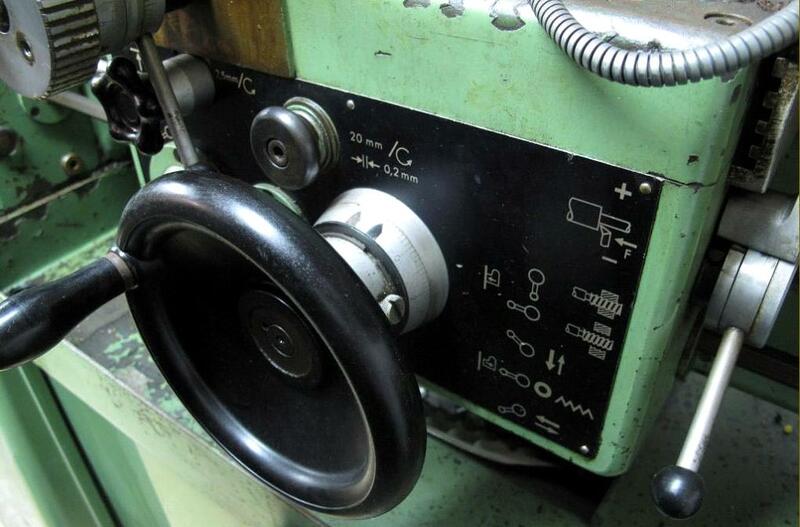 The carriage-traverse handwheel was fitted with a micrometer dial and could be pulled out to disengaged it from the rack when using the sliding feed or screwcutting. Strongly built and of deep section 340 mm (13.75") the saddle was long and fitted with both front and rear tapered gib strips; the cross slide was machined from a robust casting and of the full-length type; it was fitted with a raised platform at the rear carrying two T slots to allow the mounting of a parting or other tool holder. The full-circle handwheels carried zeroing satin-chrome micrometer dials and, whilst that fitted to the cross slide was of a reasonable size and fitted with a knurled rim of greater-than-usual depth, that used on the top slide was (as ever) too small. Both feed screws were hardened and ground and that operating the cross slide benefited from running through a small oil bath. A rather large precision 4-way toolpost of patent design was supplied as standard though, if so inclined, the customer could opt for a simple "American" single-post type instead. During final assembly the cross and top slides and their ways were all hand scraped to a "perfect" fit. In order to minimise vibrations transmitted to the headstock the entire drive system was fully enclosed within the cabinet base with the electrical controls fitted to the front face of a sheet-metal enclosure above the headstock - and hence safely out of harm's way from splashing coolant and dropped spanners . The main switches, motor starter, fuses, coolant pump overload relay, lighting transformer and various connecting plugs were neatly housed together within a large metal locker that covered the headstock-end of the lathe. The customer was given a choice of two "electromagnetically-braked" 2-speed motors; they both had the same 3 and 5 hp outputs but their speed ranges were different: 1500/3000 rpm and 1800/3600 rpm. From the motor the drive was taken by an endless flat belt to a 4-speed, base-mounted gearbox that contained a set of nickel-chrome, heat-treated and hardened gears that were always in mesh with the speed changes by sliding dog clutches; from the box the drive rose to the headstock spindle by a "silent" chain giving what the makers claimed was a strong, reliable and smooth transmission of power with a spindle-speed range from 28 to 2500 rpm. The base-mounted gearbox shared the same oil supply as the headstock and screwcutting gearbox. Of unusual (and patented) design, the set-over tailstock had a spindle fitted with an angled, fine-feed handwheel drive that, once the worm-and-wheel feed was disengaged, could also be activated by a quick-action, capstan-handled control operating through a rack-and-pinion. With a No. 3 Morse taper, the 40 mm (19/16") diameter spindle was hardened and had a travel of 180 mm (7"). Even when fully extended, a good proportion of it (150 mm/6") remained fully supported within the casting. Constructed from welded, braced, sheet steel the cabinet stand had a tall splash back that turned inwards at the back and right-hand side (to make a deeper enclosure) and a pair of sliding door on the front that gave access to a decently-sized storage compartment. Besides the usual range of accessories - steadies, chucks, collets, capstan attachments and various kinds of toolpost - an ingenious and neatly designed taper turning attachment was also available that could be brought into operation without the need to disengage the cross feed nut from its screw. 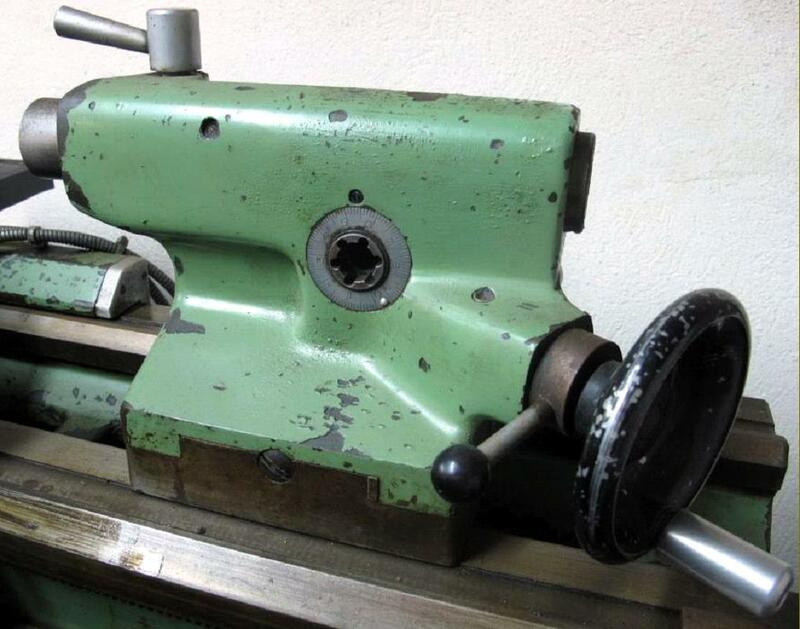 The unit was also able to turn against templates and the makers offered a variety of standard profiles including those for the common sizes of Morse taper. 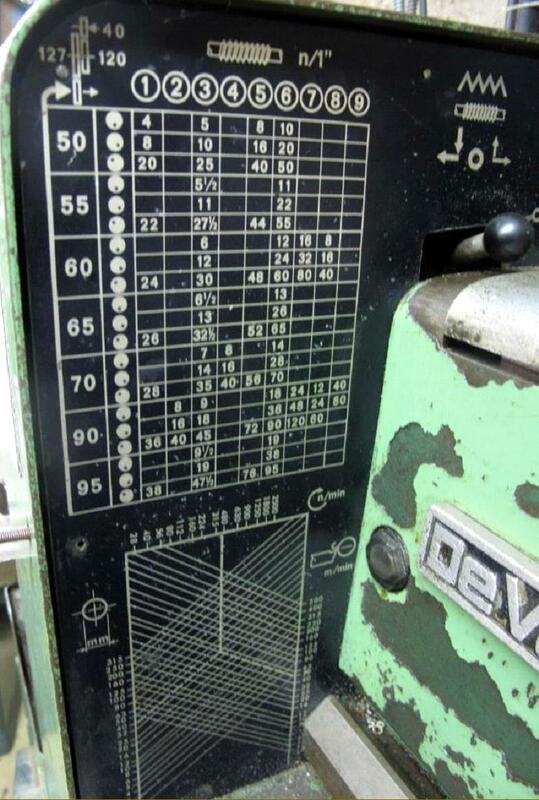 The French used a home-grown system for testing the accuracy of their precision machine tools - the "Salmon Standard" - though the makers admitted that for the benefit of a customer they would also check and apply any of the other standards by Schlesinger, D.I.N. or ISO and would also, for a small additional charge, apply a higher standard of checking during the build and on the finished machine if considered necessary..